The Westminster Government is currently selecting a location for the UK's first spaceport, with Prestwick, Machrihanish and Stornoway airports all in the running. 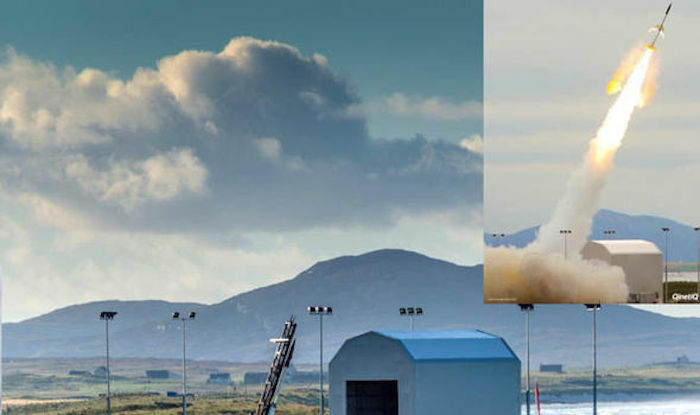 Now it has emerged that a "vertical launch spaceport" in the Outer Hebrides is also being considered to allow Britain to surge ahead of China, Russia and India in the global space race. It would be located at the existing Hebrides Missile Range on South Uist, where the first space launch from UK soil took place last October. That was a ballistic missile fired as part of a Nato war games exercise and blasted to pieces by the US Navy. QinetiQ, which operates the range for the Ministry of Defence, believes the launch site could also be used to put satellites into orbit. The firm gave a presentation to a Spaceport UK conference last month, stating: "There are similarities between capabilities demonstrated by QinetiQ for launch of ballistic targets and the capabilities required to establish a vertical launch spaceport." It was delivered by Tim Humphries, QinetiQ's Business Development Manager, Missile Defence and Strategic Weapons, who demonstrated how a space launch would work from South Uist. He predicts it would mirror the missile launch trajectory, heading west before an "orbit injection" high above the North Atlantic. The conference, organised by the Royal Aeronautical Society, also heard from French aerospace and defence firm Airbus. An Airbus team has put together a detailed business case for a UK "orbital launcher" to meet the growing global demand for new satellites. In this scenario, the rockets would blast off to the north and reach orbital speed high above the Greenland Sea. Airbus says the UK is already a "global leader" in space technology and has "the capability to provide all mission aspects except launch". The firm adds that a "dedicated and reliable small launcher service" in the UK could capture 40 per cent of the non-military market with "China, Russia and India excluded". The team behind the Stornoway Spaceport bid is also backing the "vertical launch" capabilities of the Hebrides Range. Retired Air Commodore Mark Roberts CBE, from engineering firm Atkins Global, told the conference the range has access to the "largest segregated airspace in Europe". Joe MacPhee, Head of Economic Development with Western Isles Council, which is working with Atkins on the bid, said yesterday: "It's very early days but we think the Hebrides would be the ideal site for both vertical and horizontal launch spaceports. The idea clearly caught everybody's attention."